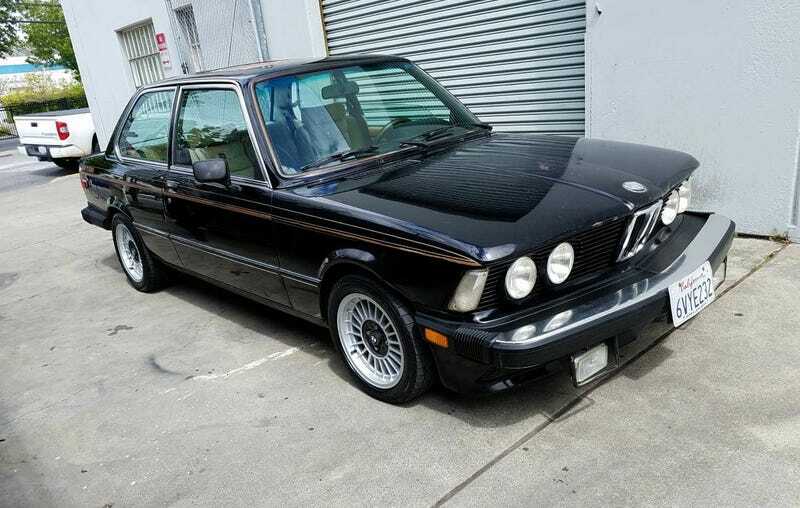 At $8,977, Could This 1977 BMW 320i H&B Turbo Prove The Pick Of The Litter? Today’s Nice Price or Crack Pipe 3 Series is one of four the seller has on offer. Its old-school cool Hardy & Beck add-ons make it the most interesting of the group, but let’s see if its price is enough to get your undies in a bunch. How do you celebrate a notable achievement? For me it involves awkwardly attempting to high-five those nearby and then pointing finger guns at them while addressing the deniers with ‘okay then, maybe later.’ Yeah, it’s a party wherever I go. Cool cars don’t necessarily have to imply cool owners, but some rides are just so unique and interesting that to be properly acknowledged it takes an owner with Stacy’s Mom-level of got it goin’ on to fully appreciate it. That’s why I think there’s a limited but perhaps enviable audience for this 1977 BMW 320i Turbo. Now, I want you to close your eyes, sit back, and imagine the 1970s. What’s popping into frame, flare jeans, coke spoons, disco queens, and slow cars? Ha! No doubt. That was the ‘70s in a nutshell. Sure, the decade was far more complicated than that, but this isn’t the History Channel! What we do want to focus on though, is that last icon of the era, the slow car. This was a low point in time for the auto industry which was hit during the decade with the triple whammies of constricting emissions standards, constrained fuel availability, and product lines that weren’t ready to fight either battle. This was the decade that saw horsepower ratings drop precipitously as automakers went from reporting gross ratings to net. They dropped even further as the call for cleaner and more efficient cars and trucks was reluctantly answered. What was an enthusiast supposed to do in such troubling times? Turn to the aftermarket no doubt. This E21 represents one example of the sort of post-factory performance pimping that attempted to address the ‘70s’ capitulation to crappy car capabilities. The company that massaged it—Hardy & Beck—is amazingly still in business today, offering service on BMWs, Minis, and Audis up in Berkley. Back in the ‘70s they made a name for themselves modding Bimmers just like this. What they did here was to add a turbo to the BMW’s 2-litre M10 SOHC four. That boosted power from 105-horses to somewhere in the neighborhood of 165, a sizable jump. In addition to the turbo plumbing this E21 also carries some sweet ‘70s visual markers. Those include sweet H&B Turbo side stripe decals, a rubber ducky rear spoiler, and inside, a set of Scheel-Mann seats that look like a pair of hookah-smoking caterpillars from Alice in Wonderland, but are probably comfortable as heck. Those seats are a little tired, but still serviceable until they can be recovered—in ‘70s-appropriate fabric of course. Amazingly, the top of the dash remains crack-free. Below that is a plethora of loose wires and dropped panels indicating that someone tried to fix the stereo and perhaps gave up half-way through the job. The steering wheel is aftermarket and looks like it might be a Momo unit. It’s missing a badge in the bottom spoke, the purpose of which remains annoyingly vexing. The bodywork is a bit of hit and miss. The hood shows some damage on the front lip, as well as some rust on the center strake. The rest of the body seems in fine shape, with no rot evident in the pictures. Under the hood things look amazingly tidy. The turbo’s close proximity to the windshield washer reservoir is somewhat alarming, however the plastic tub shows no indication of having suffered living next door to that hot commodity. The seller says the car ‘starts, runs and drives,’ a glowing endorsement if I’ve ever heard one. Sadly, the car doesn’t ride on H&B wheels, some of the rarest rollers in all of BMW-dom. Instead it rocks reproduction Alpinas. It also carries 113,000 miles and comes with a clean title. This H&B Turbo is just one of a quartet of 3 Series this seller packs wall-to-wall within his one Craigslist ad. It also happens to be the most unique and desirable of the collection, an important deciding factor when he’s asking similar amounts for almost all of them. The price for this one is $8,977, and it’s now that point where I ask you to vote on that price after having weighed the pros and cons of the car. What do you think, is this cream of the seller’s crop worth that $8,977 asking? Or, for that much would you rather have the companion’90 E30? San Francisco Bay Area Craigslist, or go here if the ad disappears. H/T to Damnthisburnershitsux for the hookup! For $5,000, Could This Two-Top Two-Back 1987 Nissan Pulsar NX SE Be Too Much?